A rustic tart, otherwise known as a galette, is a simple way to showcase seasonal fruits or vegetables. The inspiration for this dessert came from the gorgeous berries at my local farmers market. 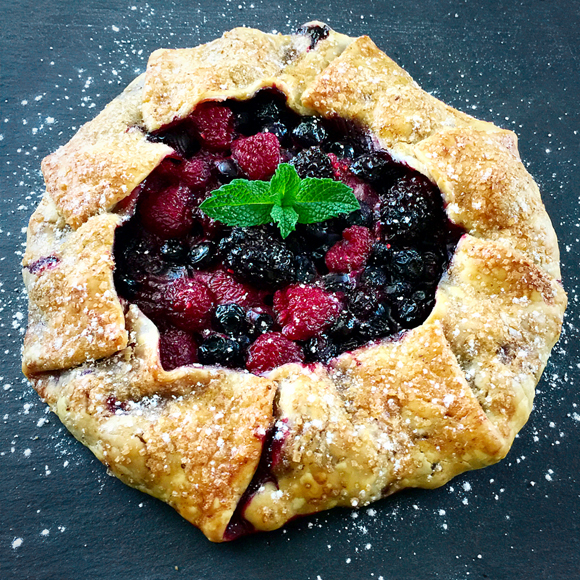 Ripe blackberries, blueberries and raspberries make this Triple Berry Galette shine. Bursting with berry goodness, this beautiful dessert is guaranteed to be a summer favorite. Preheat oven to 425 degrees. Bring refrigerated pie crust to room temperature (or follow package directions). Gently unroll and place pie crust on a baking sheet lined with parchment paper. Prepare chia wash: Combine the ground chia seeds and water in a small bowl. With a small whisk, whip the ground chia seeds with the water to make a wash (it should be the consistency of beaten eggs), set aside. The chia wash will get thicker as it sits. In medium bowl combine the berries with lemon juice and cane sugar to taste. The amount of lemon and sugar depends on the ripeness of your berries and your personal preference. Spoon the berry mixture into the center of the dough circle, leaving a 1-2 inch border around the edges. Brush the exposed edges of the dough with the chia wash and then carefully fold edges up over the filling, leaving the fruit exposed in the center. Fold the dough into pleats so it lays nicely over the fruit. Pinch to seal any cracks if needed. Gently brush the chia wash over the outside edge of dough and sprinkle dough generously with the coarse turbinado sugar. Bake galette for 30 to 35 minutes, or until the crust is golden and the fruit is bubbling. Let cool and serve room temperature. Garnish with a light dusting of powdered sugar and serve with fresh whipped cream. In a large bowl, whisk together vinegar, lime juice and then slowly whisk in oil. Toss in mangoes, avocado and red onion to coat. Add fresh ground salt and pepper to taste. 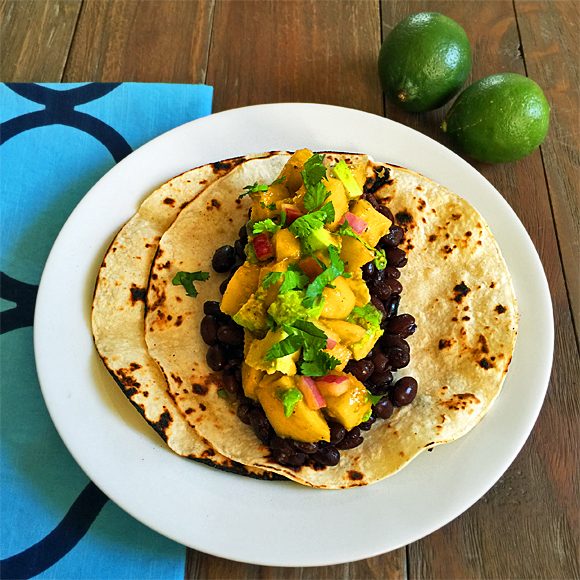 Serve with tortilla chips or in a taco with black beans and cilantro. Everyone loves lasagna, but if your gluten free you might try to avoid it. It's now easier to find gluten free lasagna noodles at the grocery store, but why not do something crazy like use a vegetable instead. This vegetarian lasagna uses butternut squash in place of the noodles, which offers more nutritional value. 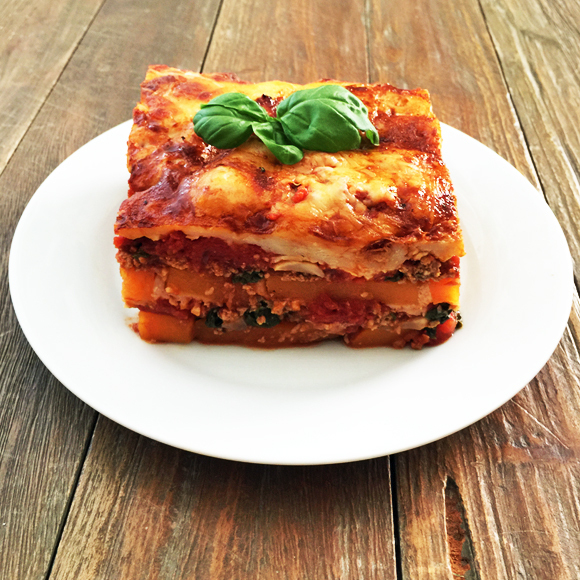 The result is a savory, hearty vegetarian/gluten free lasagna, that won't weigh you down. To make this dish vegan replace the mozzarella with a vegan cheese or skip it altogether, it's delicious either way. Pre-heat oven to 400º F. In a skillet with some olive oil sauté the Beyond Meat Beefy Crumble, onions and mushroom over medium heat until onions are just starting to become transparent. Add garlic, spinach, red pepper flakes, fresh ground salt and pepper and cook another few minutes. Remove from heat while the spinach is still bright green and set aside. Time to prep the squash. Cut the top and ends off the squash and peel it. Cut the squash in half width-wise, right where the squash starts to turns bulbous. Split the two halves in half lengthwise. Remove seeds and slice the squash into planks. Make sure your planks are the same width for even cooking, 1/4-1/2" thick. In a 4 quart baking dish, put down enough sauce to lightly cover the bottom of the dish (this keeps the squash from sticking). Add the squash planks to cover the bottom of the dish, cut the planks into smaller pieces as needed to fit in any gaps without overlapping. Lightly salt and pepper each squash layer. After the squash, spoon half of the mushroom mixture, a generous layer of sauce and a layer of cheese. Repeat again with another layer of squash (lightly salt & peppered), remaining mushroom mixture, sauce and finish with remainder of cheese. Bake for 45 minutes or until browned on top and bubbly. Stick a knife into lasagna to make sure the squash is fork tender before removing from oven. It will be quite liquidy when it comes out of the oven, let it set for a good half hour before cutting into it, as it will solidify. 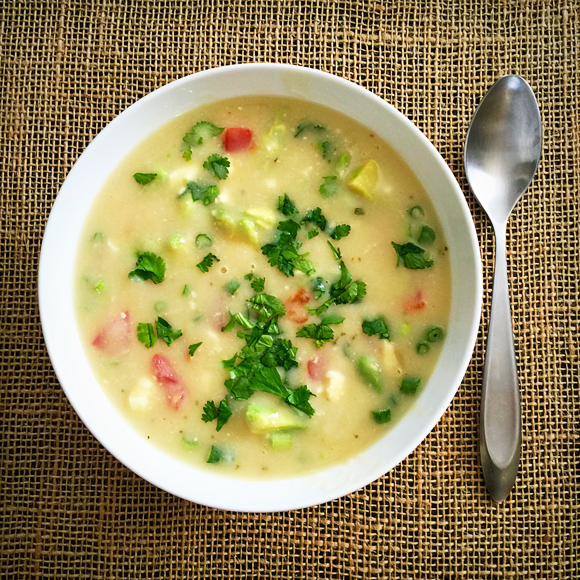 Winter weather calls for an easy, warming, home made bowl of soup. Sopa de Ajo is a delicious Mexican broth based soup that is satisfying and perfect anytime, but especially good when you feel a cold or flu coming on. The simplicity of this recipe, from The Gourmet Vegetarian Slow Cooker cookbook, is the best part. Besides the peeling of a lot of garlic cloves, this slow cooker recipe is one of the easiest soups you will ever make. I could use another bowl of it right now! Place the water and garlic in the slow cooker insert, cover and cook on low for 6 to 8 hours, or until the garlic is tender. Add the bread to the broth, replace lid and allow to soften for about 10 minutes, then puree the garlic and bread using a handheld immersion blender. Add the olive oil and salt to taste. To serve, place some of the avocado, oregano, cheese, tomato, and green onions in the bottom of each bowl, then ladle in the broth over the ingredients. Top each bowl with a sprinkle of cilantro. I'm sure you've heard about the amazing benefits and uses for coconut oil, but most people still run to the drugstore to purchase chemical laden products to cure every day problems. My family has been using coconut oil for years. Even though this oil has been trending recently, some people still don't realize it's unbelievable virtues. Mother Nature makes the most outstanding natural "products" and below are my top 5 favorite uses for this oil. Keep in mind that coconut oil is a solid when it's temperature falls below 76°F, and it is a liquid at temperatures above 76°F. Living in Southern California, my jar of coconut oil is generally always in liquid form, which makes it easier to use. To quickly liquify your solid oil, just zap it the microwave for a few seconds. Use organic virgin coconut oil, which is cold-pressed and unrefined, for the greatest health benefit. • Coconut oil is an inexpensive conditioner for your hair and excellent when used as an overnight hair treatment. If you're short on time, try rubbing the oil into the ends of your hair before shampooing to keep your locks from drying out. It can also be used sparingly for an easy hair finisher that adds shine and tames those frizzy flyaways. • The same holds true for your face and body. Use coconut oil as a night time moisturizer on your face, neck and décolleté several times a week. However because it's an oil, it does not work well under makeup. For daytime use try rubbing a little coconut oil onto your face and neck after cleansing, let it absorb for 5-10 minutes, then wipe off excess with a clean dry washcloth and proceed with your normal day cream and sunscreen. It can also be used as a make up remover. • For strong nails and healthy feet, rub coconut oil into nails, toe nails and on the bottoms of your feet. Because coconut has natural antifungal properties, it's a good idea to apply in between your toes and on your toe nails to prevent or treat a common form of nail fungus or athletes foot. • Whiten your teeth naturally without damaging the enamel by mixing baking soda and coconut oil together, then gently brushing it on your teeth. You can also rub coconut oil directly onto your gums daily. Coconut oil destroys the bacteria that causes bad breath, tooth decay and gum disease. Internal Health - Good health starts from the inside, so naturally a spoonful a day can go a long way. It can fight off fungus in your intestines, reduce inflammation, boost your immune system and increase energy without added weight gain. Despite the high calories of coconut oil, the medium chain triglycerides in this oil are easily burned, can increase metabolism and is not stored as fat. 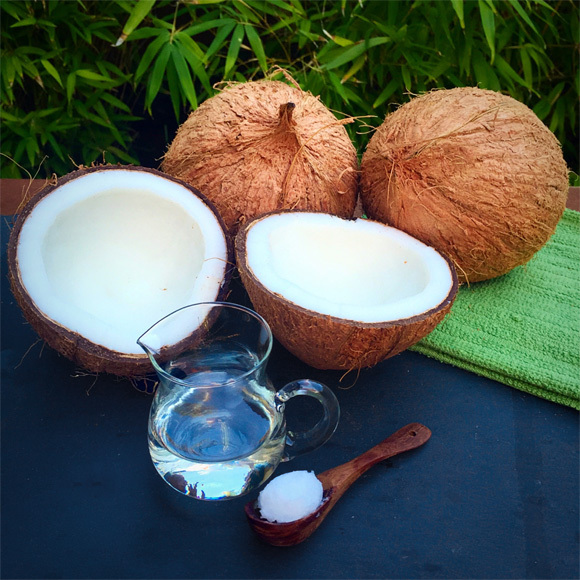 First Aid - The antibacterial and antifungal properties of coconut oil make it good for disinfecting cuts, soothing rashes, bug bites, sunburn and promoting the healing of wounds. Pet Care - The same benefits that human experience using coconut oil can also help your pets. Most dogs and cats love the taste of coconut oil and will happily lap up a spoonful. Or you can try putting a spoonful in their food. It's great for their coats and dry skin but also helps with digestion, joint health and can improve their breath! It's also useful when applied topically to hot spots and can kill fleas if lightly brushed into their fur. However, be careful because the oil can get on your furniture if you use too much. In the Kitchen: Virgin coconut oil is unrefined and has a lower smoke point (350°F) than refined coconut oil, which means that it is not meant for high temperature cooking. It can be used for a light sauté but keep in mind it gives your food a coconut flavor. Try using coconut oil on toast in place of butter and in coffee instead of creamer. It's great mixed into smoothies or in your morning oatmeal. My favorite use for coconut oil in the kitchen is in baking and candy making. 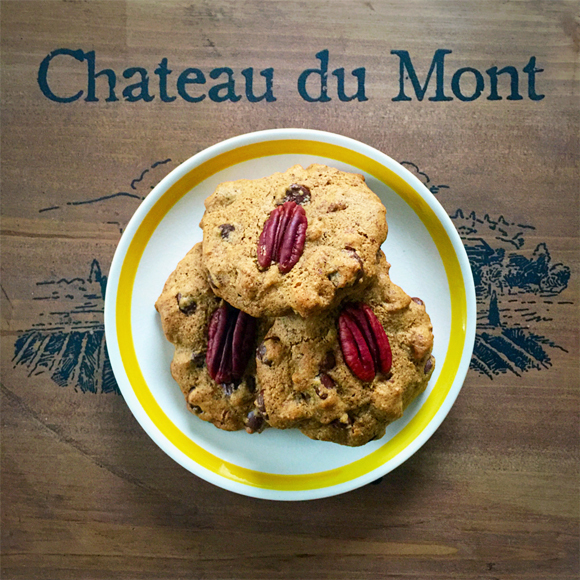 Here are links to some of my favorite sweet treat recipes: Dark Chocolate, Coconut and Almond Hearts of Joy, Cacao Coconut Healthy Hearts, Chocolate Chip Cookies, and Carrot Cake. I always recommend doing your own research to educate yourself on natural products. There are many other health conditions that benefit from the use of coconut oil, so if you have a particular condition, look it up and see if coconut oil is for you. Don't forget that coconut flesh, coconut milk and coconut water are also wonderful additions to your diet.